“The World Health Organization estimates that 2.5 million people die each year from alcohol abuse alone.”Drug addiction is an overwhelming force that can take over your entire life. Shame prevents many people from seeking the rehab and recovery treatment they need to make a successful recovery. Unfortunately, a general lack of empathy makes it hard for many people to understand the struggles that others go through when coping with a drug addiction. One common approach to drug addiction treatment is a 12-step program, which was made popular by groups like Alcoholics Anonymous and Narcotics Anonymous. While the 12 steps are effective for many people, they do not work for everyone. Narconon offers an alternative support network for those who do not feel they would thrive in a 12-step program. The World Health Organization estimates that 2.5 million people die each year from alcohol abuse alone. If you would like to find out more about non-12-step rehabilitation, contact our 24/7 hotline at 1-888-319-2606 Who Answers? today. Narconon claims a 70-percent success rate in rehabilitating individuals struggling with both drug and alcohol addiction. Since opening in 1966, Narconon reports that it has helped thousands of individuals on the path to recovery. Narconon was primarily founded based on author L. Ron Hubbard’s work and philosophy. The primary goal of Narconon is to help people recover from drug and alcohol addiction without the use of substitute drugs. Many rehabilitation centers provide medication therapy to help with the withdrawal process and prevent relapse as a person enters recovery. Narconon does not believe in this philosophy, and the organization provides individuals with a drug-free option for recovery. What is the Narconon Recovery Process? The Fundamentals of Thought by L. Ron Hubbard serves as the basis for the Narconon methodology of treatment. Patients are given therapeutic training routines (TRs) to use during their treatment sessions, which are typically at an inpatient Narconon clinic. All patients receive an examination by a medical doctor before participating in the recovery program. After patients gain admittance to the Narconon facility, the withdrawal process begins. Narconon withdrawal is solely “cold turkey,” meaning that patients have no access to drugs or alcohol during treatment. This is an essential step for most patients and a major reason why many addicts seek treatment in a residential facility. The drug-free environment creates an atmosphere of success that it is usually not possible to replicate in the patient’s daily life. 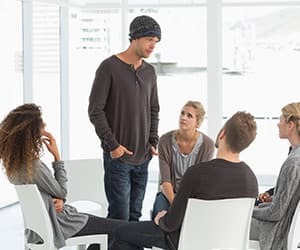 While the Narconon program does not use the standard 12 steps found in other peer-support programs, they do offer practical steps that patients can apply during the withdrawal and recovery process. Patients are also required to abstain from junk food in addition to alcohol and drugs during their stay at a Narconon facility. The patient must also follow special nutritional and exercise guidelines to ensure that the recovery process goes smoothly. Narconon has been the center of some considerable controversy for its strictly drug-free approach to rehabilitation. Many celebrities have endorsed the program, and there are two cases of death due to seizures that occurred while the deceased were under care at a Narconon facility. What Makes It Different Than Typical 12 Step Programs? A non-12-step program is considerably different from a traditional 12-step program, although both types of programs share a common goal of helping individuals recover from severe drug and alcohol addictions. Non-12-step programs do not require that participants surrender their life to God or any higher power, while most prominent 12-step programs do. Instead, treatment revolves around practical means and indicators of wellness. While 12-step programs are spiritually based in nature, non-12-step programs, such as Narconon, do not require the individual to believe in a higher power at all. Another major difference in approach between 12-step recovery program and non-12-step rehabilitation programs is the way in which the addict is generally perceived. Twelve-step programs typically use language that paints the addict in a helpless light. The addict must acknowledge their helplessness and powerlessness to control the addiction. They must also recognize the personal flaws that led to the addictive behavior, and they must ask a higher power to forgive them for those flaws. A non-12-step program focuses instead on the power of the individual to overcome addiction. Through a combination of medical care, nutrition, daily exercise, and counseling, they attempt to instill a sense of confidence in the individual to empower them to overcome their addiction and continue into recovery. If you or someone you love is struggling with addiction to drugs or alcohol, it is not too late to get help. Call our 24/7 hotline at 1-888-319-2606 Who Answers? for more information on Narconon and other non-12-step programs for drug and alcohol rehabilitation.